I've just spent 2 wonderful days at Trelowarren, Nr Helston Cornwall at workshop held by Alison Willoughby (Skirt Artist). Organised by Cornwall crafts offered at a bargain cost of £60.00 for the 2 days. She taught us many different and exciting stitch techniques. Here are some off my samples. There are more on my Flickr site. 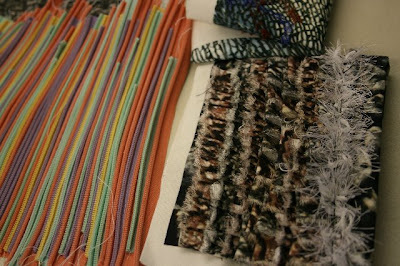 This exhibition marks the halfway point in my MA Textile Design, showcasing samples and prototypes of my work in progress. My aim is to design and create soft sculptures using digital technologies from computer design programmes through to laser cutting and digital fabric printing; by combining traditional methods such as screen-printing, machine and hand stitch embellishment to give a handcrafted feel. Why have you chosen this particular focus? In a busy modern world it is sometimes difficult to remember to enjoy the smaller things that surround us. I have been influenced by what is on my doorstep, a hawthorn tree, which is full of life and an abundance of activity and entertainment. I have become an avid birdwatcher and weather permitting, I sit under my tree to read, research, sketch and make. Garden birds can sometimes get taken for granted or overlooked, but in a world of ever decreasing green space and woodlands they have become more and more dependent upon us feeding and housing them. My work is a gentle reminder of our feathered friends and the pleasure they give. What processes have you involved in the production of your final Designs? I began by looking at dolls, soft toys, the hawthorn tree and ornithology. I use photographs, film and observational sketches to study the characteristics of each individual bird. Research into nursery rhymes, fables, and myths and historical and modern tales surrounding the chosen birds have all influenced the design for each bird and their respective houses. Using my imagery, I manipulate it using different computer programmes to generate and refine ideas and concepts. At heart I am a maker, I enjoy the challenge that new digital technologies bring and adore traditional textile making methods, by combining the two is of pure self-indulgence. Do you aim to develop these ideas further? With nine species of bird regularly visiting my garden I intend to complete further studies and produce birds and houses to represent them. 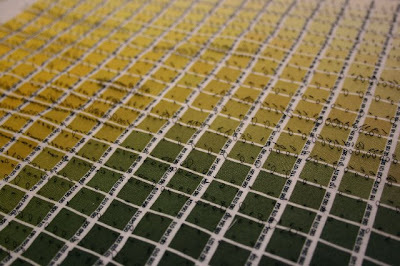 The process of ‘placed’ designs has opened up many new possibilities and I intend to use these methods in future work. However, I also intend to carry on researching and using new digital and traditional methods of creating soft sculpture. What element or aspect of the design(s) would you want people to notice? The detail of each individual piece, however tongue in cheek it may be. What one word would summarise you as a designer? One year on... 4 graduating and 4 midway with another year to go " The 8 of us". Watch the film of my show called "Simply stop and take in the moment..."